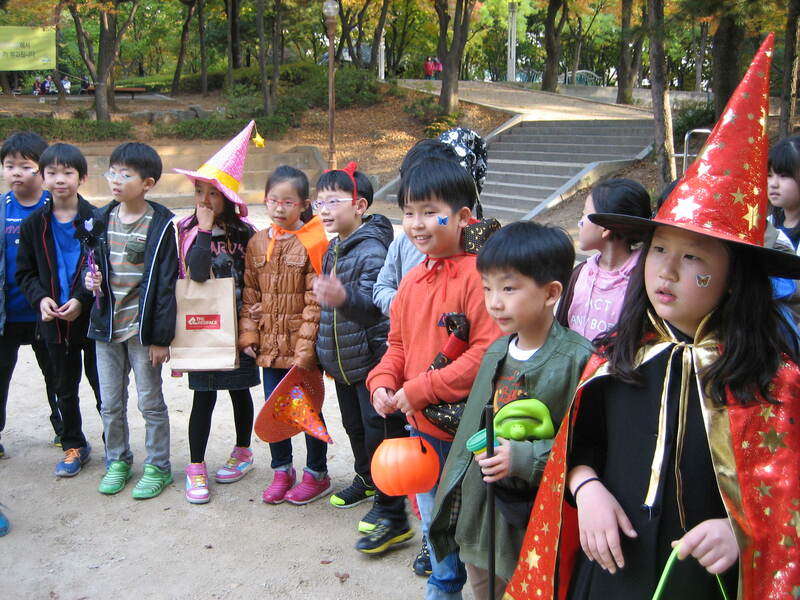 Because Halloween is not traditionally celebrated in Korea, Ryan and I were asked to head the planning of Halloween celebrations at our school – the day before Halloween. 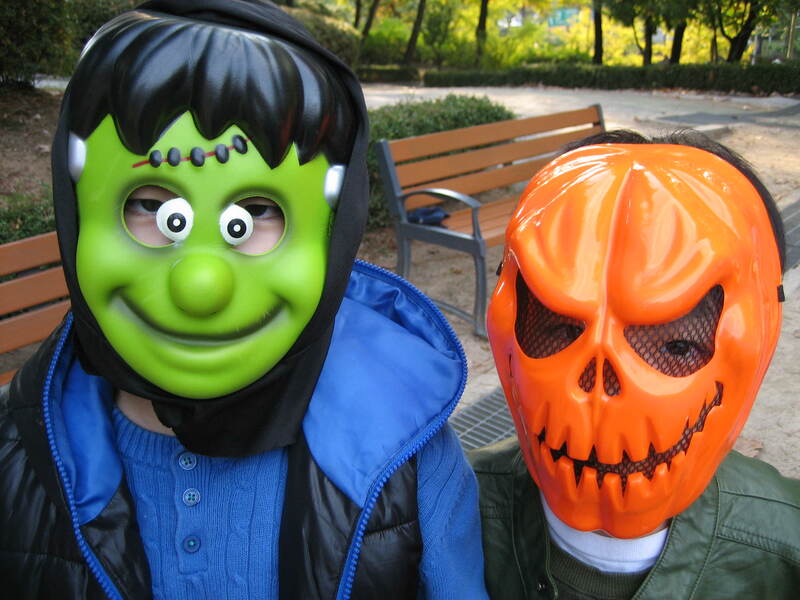 Halloween in a hagwon is last-minute, like many things. We scrounged up an assortment of games and activities around Halloween vocabulary (witch, ghost, Frankenstein, haunted house, etc.) and tried to think of creative costumes to wear. 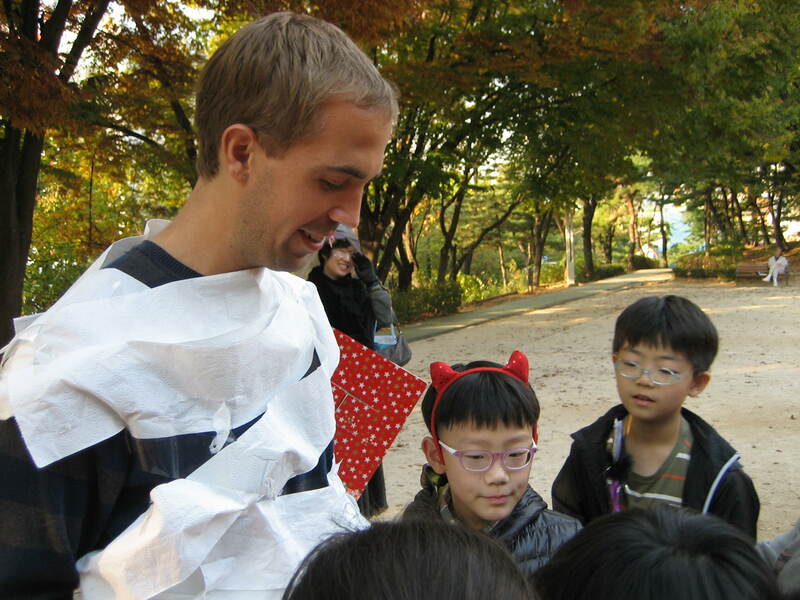 Thus, the hour before school on Halloween found me wrapping Ryan in two rolls of toilet paper to transform him into a mummy. Toilet paper is not all that sturdy, and even with scotch tape and repeated re-wrappings, Ryan’s mummified wrappings were falling off before the kids even arrived. 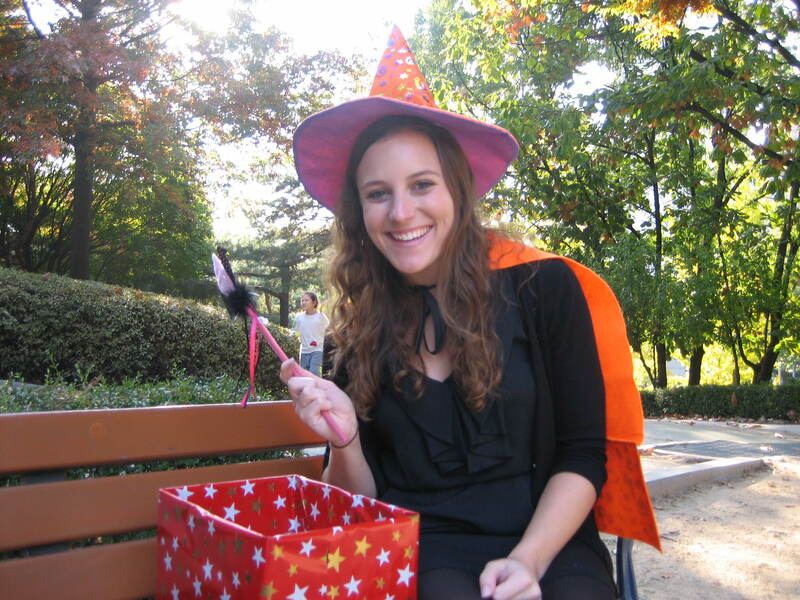 I took an easier route and borrowed a kids’ witch hat and cape that our school manager had bought to supplement Halloween decorations, and just wore all black. Our co-workers were highly entertained by Ryan’s impromptu costume. They burst out in fits of laughter every time they saw him, and kept coming back to take more pictures of us. 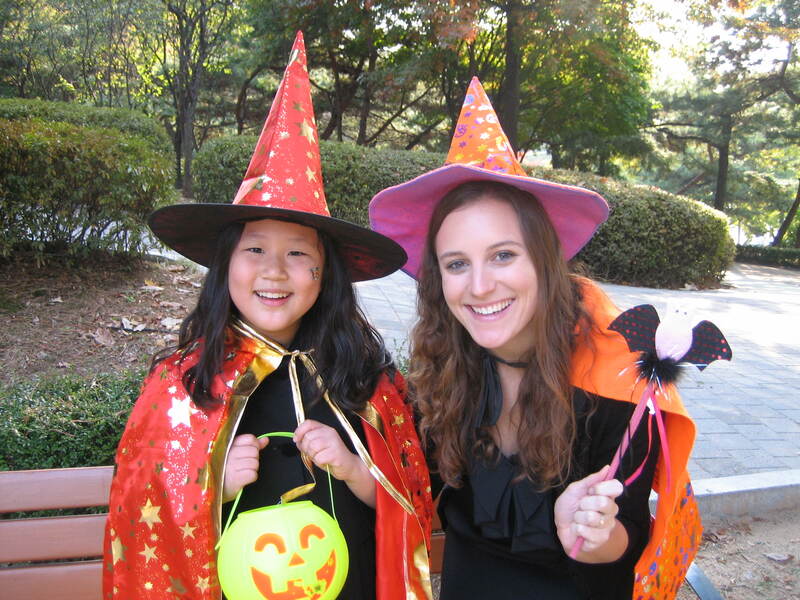 After the kids arrived for the first class, we walked to a nearby park so the kids could “trick or treat”, which in this case meant running around the park and finding our school managers, who were holding large Styrofoam pieces decorated as doors, and would hand out candy when the kids knocked. Ryan and I were briefed on this plan, but still surprised when we arrived at the public park, one of the Korean teachers gave a few words of directions, and the kids scattered out of sight. The kids are around 6-10 years old, and I could just imagine the parental fury if an activity like this were to take place in the US. The kids were completely out of sight in a public park! Who knows what could happen! 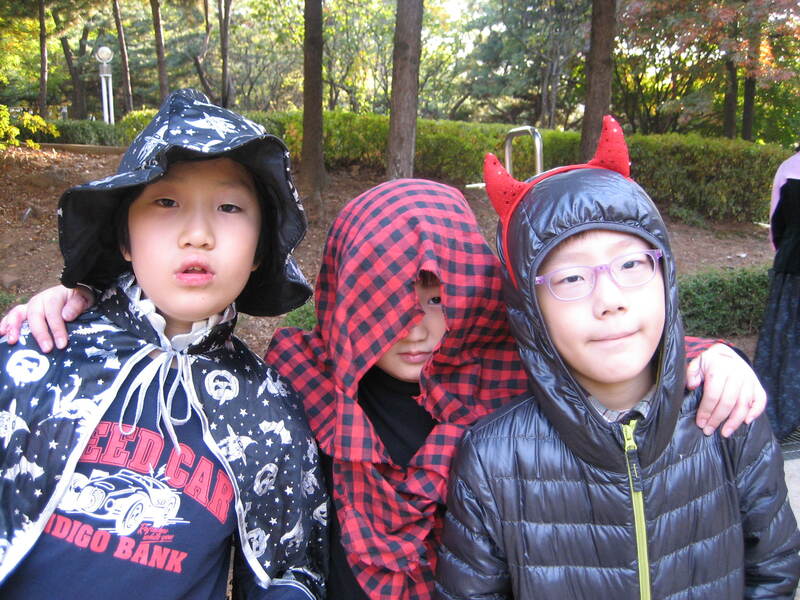 Korea is a safe place, and all the kids were back by the time we were going on to our next activity. We think. Nobody took attendance. The next activity involved Ryan and I acting out Halloween vocabulary and having the kids guess. Thus, I ended up cackling like a witch and flapping my wings like a bat while Ryan stalked some children with devil horns held high above his head. After these festivities, and much shouts of trick-or-treat (which the kids now think means “please”, as if it is a magical polite word that conjures candy out of adults’ pockets, as a week later they still try to trick-or-treat), we headed back to school. 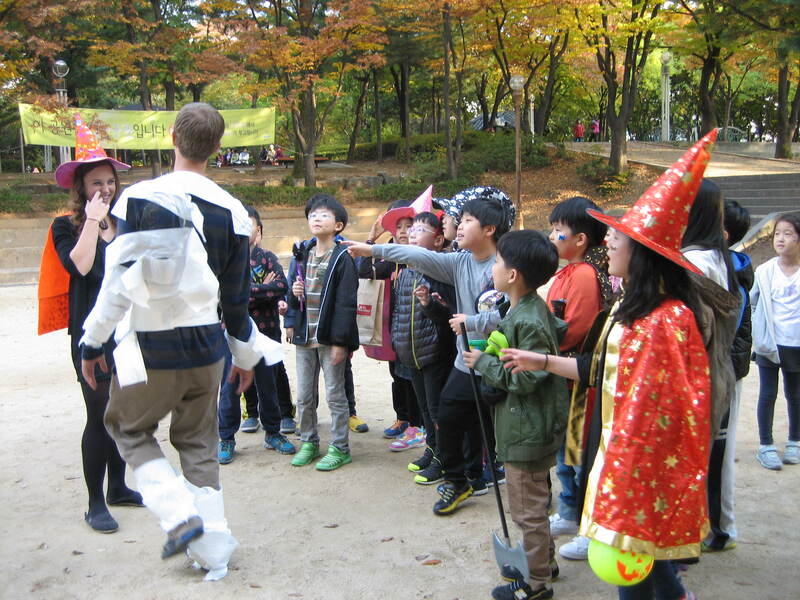 For the remainder of the day, Ryan and I were saddled with the Korean teachers’ classes on top of our own to play Halloween games. This meant that our normal classes of 5 students increased to a whopping 10 – or sometimes even 15! – students. The horror! The kids were having a lot of fun, but after five classes of managing said fun, we were quite run down. By 7 PM, our boss was very insistent that Ryan and I come to the back room. She seemed a little hurried, and we thought we might have done something wrong. The kids were quite out of hand. But Angela, kind and motherly boss that she is, had made us a plate of songpyeon (traditional Korean treats), rice cake, and a Starbucks Frapaccino to split. “You look tired”, she said, and watched our classes while we had a brief snack. Halloween was fun, but exhausting. The next day, Angela bought us pizza because she could tell we were still run down. So Halloween left us tired, with desk drawers and pockets stuffed with dum-dums, but certainly well-fed. You are obviously a “good witch” like Glenda, however I am biased. It sounds like you had a great time sharing these traditions with your students.